With A Dance with Dragons coming up in only 8 days, I started searching the internet to find good recaps of the first four novels of A Song of Ice and Fire, A Game of Thrones, A Clash of Kings, A Storm of Swords and A Feast for Crows. 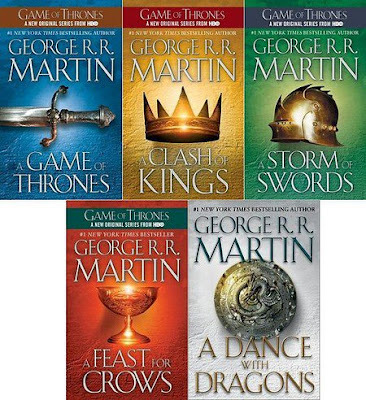 I have read the four novels many years ago so I really have to refresh my memory aside from the TV series. While Wikipedia has a small plot summary and a couple of other websites go to greater length, I have to applause the wondrous work done by Adam at The Wertzone. Over the last few weeks, he posted a thorough "the story so far" in four parts. Don't forget that it's full of spoilers (mostly so in the parts 3 and 4 covering the era of the novels), so if you haven't gone through A Feast for Crows I don't think you should read it. For everyone else like me looking for a nice recap, let's all thank Adam, amazing work! Cannot. . . .read. Not done with the first books yet! THANK YOU for posting these links. Seriously. I've been trying to hunt down something like this. I knew someone's blog somewhere must have a synopsis, discussion or something... Anyway, thanks for posting. Always a pleasure Sarah! Adam did an incredible job! Thank you so much. I didn't want to re-read the first four before Dance. Thank you. I'm so grateful. Its been so long I'm afraid to start the 5th book for fear I'll be lost! I've been looking for just this!! 2 º season does not disappoint. It is a series that it was marking epoch. tou did a great job. congrats! i found this song icr and fire on many blogs. i like the game of throne very much of all these. Great thank you! Can I be cheeky and ask if you'll be doing a Dance with Dragons one before Winds get released? Pls add dance of dragon also..